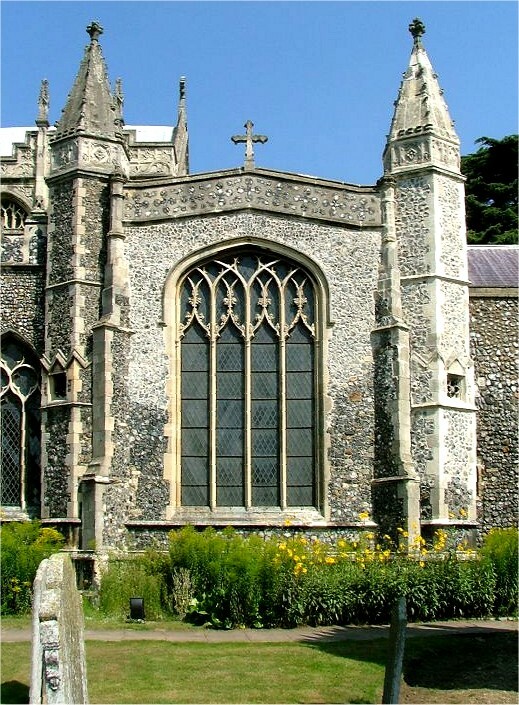 Three factors have conspired to ensure that, in the main, the churches of Ipswich are not among Suffolk's finest. 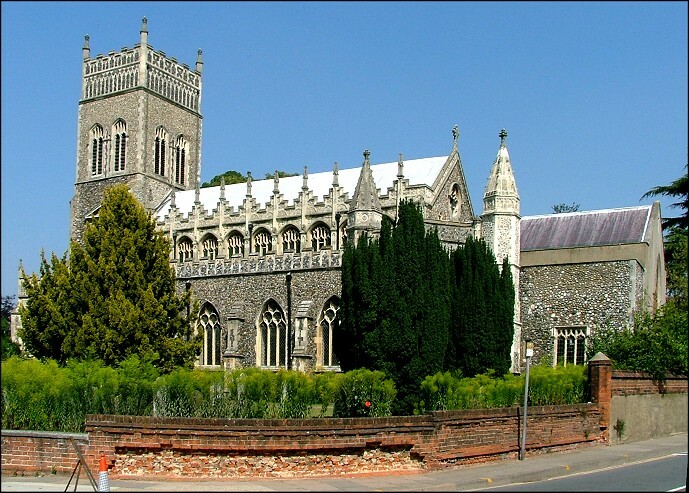 Firstly, Ipswich has been continuously occupied for longer than any other town in England. Secondly, apart from a couple of blips, it has been, throughout that time, a place of great prosperity. Finally, this was a strongly puritan town after the Reformation. Some people would say that it still is. Consequently, there has always been money for extending and rebuilding the churches, and a will for reordering them. So, little that is ancient survives. There are, of course, some treasures. 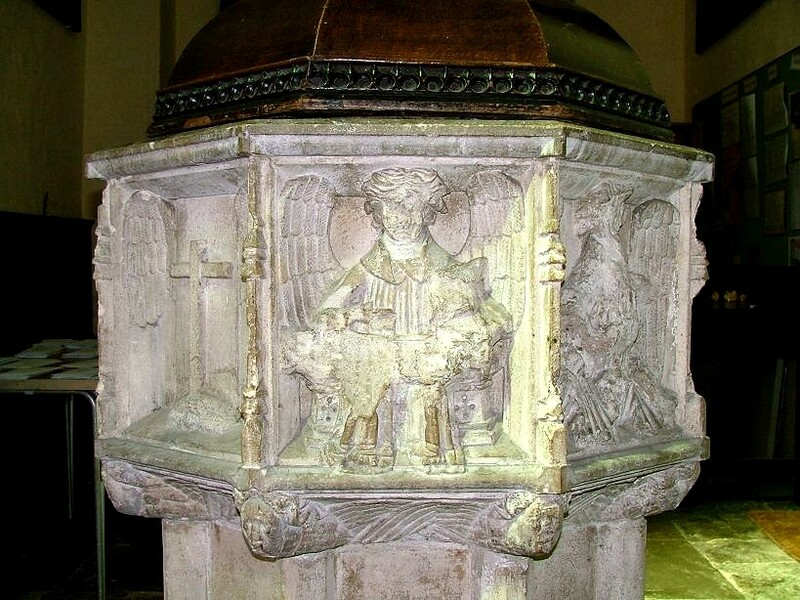 The fonts at St Peter and St Matthew are both of national significance, as are the memorials at St Stephen and St Mary at Quay. 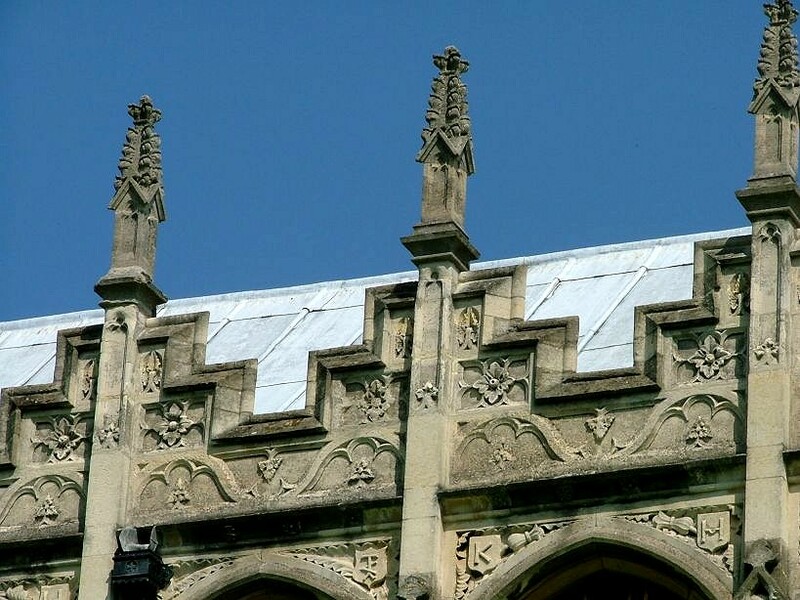 But there are others, St Helen and St Mary le Tower for instance, where you would need a very keen eye to detect anything predating the 19th century. The one great exception to this, however, is St Margaret. 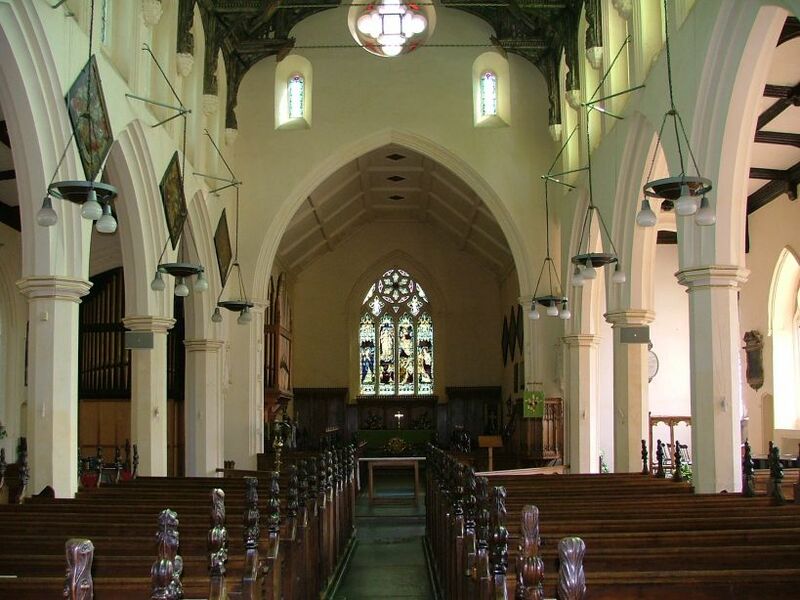 It is a very fine church indeed, and although it has suffered an internal scouring like the others, its exterior is the best of all churches in the urban area, not excluding Bramford. 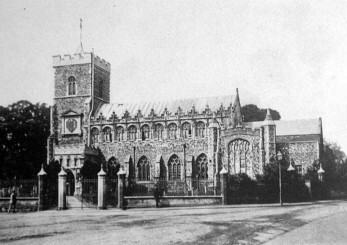 The church was built by the neighbouring Augustinian Priory, for use by the people of the expanding town when the priory nave proved too small. 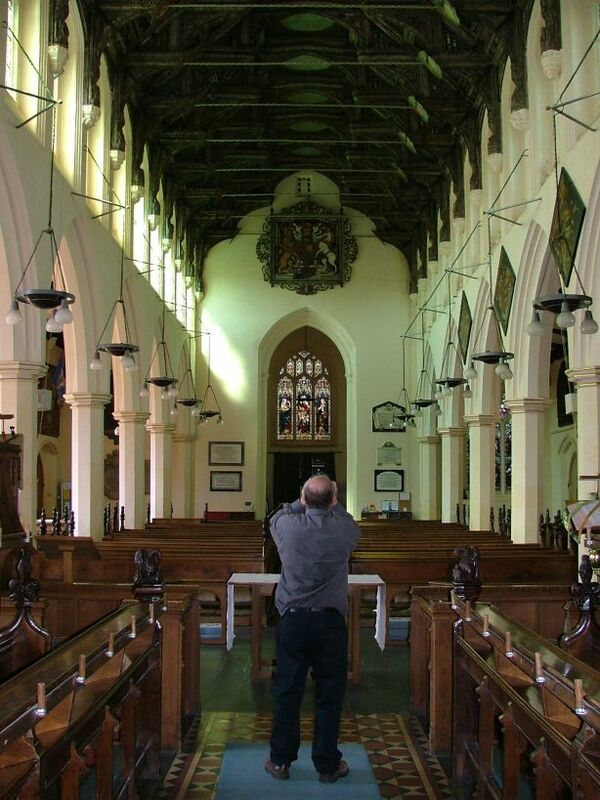 This was about 1300, and St Margaret's would remain the town's most populous parish until well into the 19th century. The fine tower is a 19th century expansion on a 15th century base, as you can see in the photograph above, taken before the restoration. Click on it to enlarge it, and you can also see that the pinnacles along the south side, superb and apparently full of 15th century confidence, are also a Victorian addition. The transept is contemporary with the original tower. 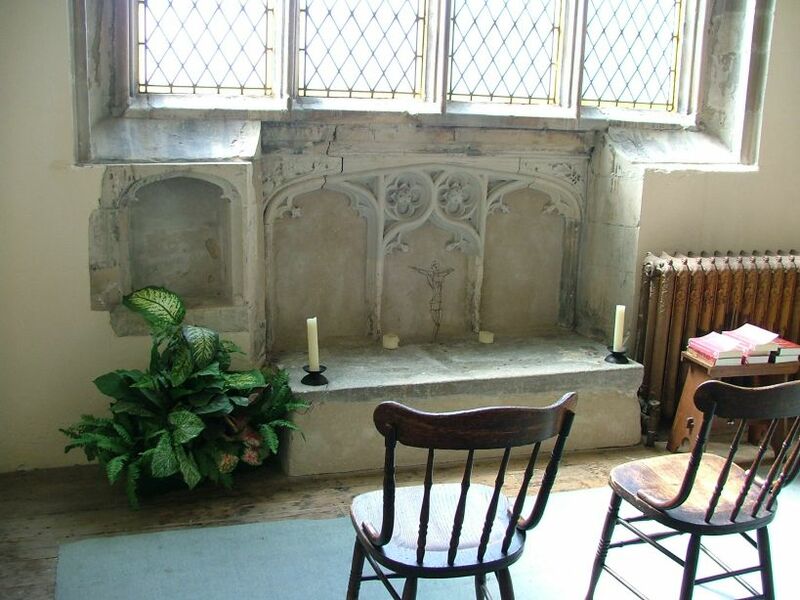 It housed the Roskin chantry, although it seems to predate this. The transept is flanked by fine turrets; the one to the west contains the roodloft stairway, but the eastern one also apparently contains a stairway, which is a curiosity. 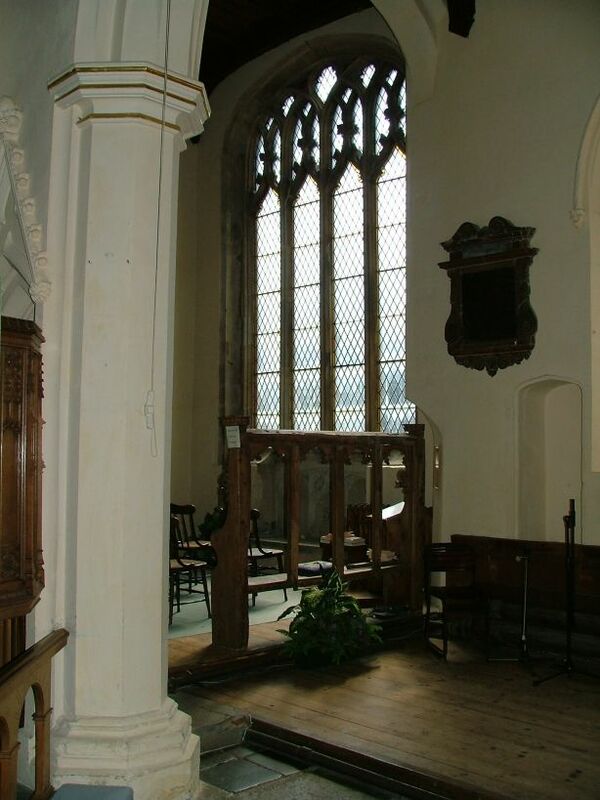 Perhaps an extension of the transept was planned, and this would have given access to a parclose. 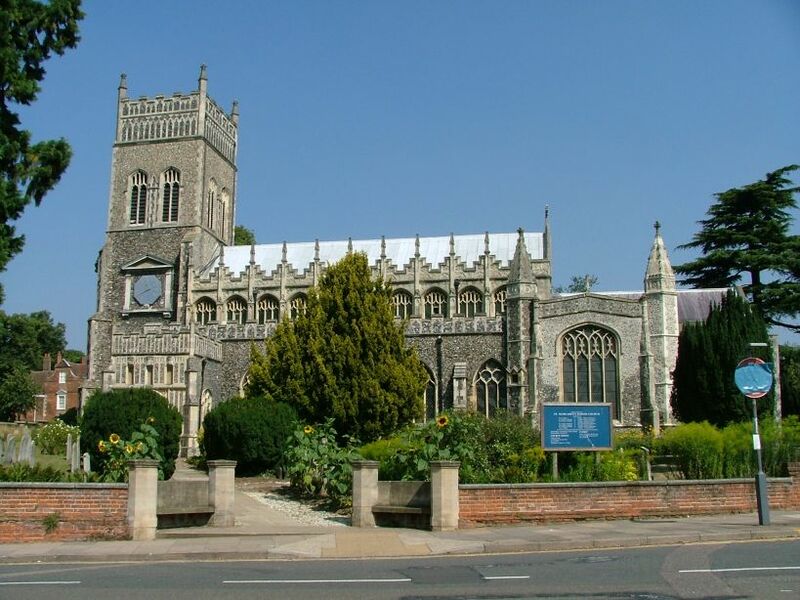 The church sits on St Margaret's Plain, tucked into a corner of Christchurch Park. 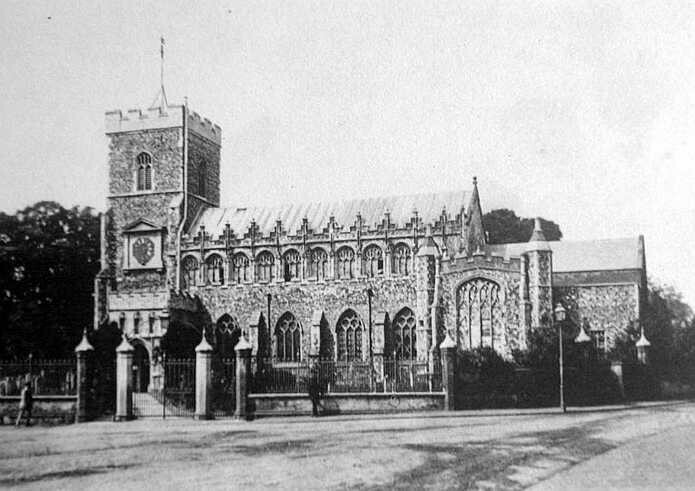 The park was the site of the Augustinian Priory, dedicated to Holy Trinity but frequently referred to in old documents as Christchurch. One of the buildings opposite the church, an estate agent, is part of the former monastery range, and its beams are full of delightful carvings. Nothing else survives; the Crown allotted the land to the Withipoll family, who demolished everything and built the magnificent Christchurch Mansion, now a museum. 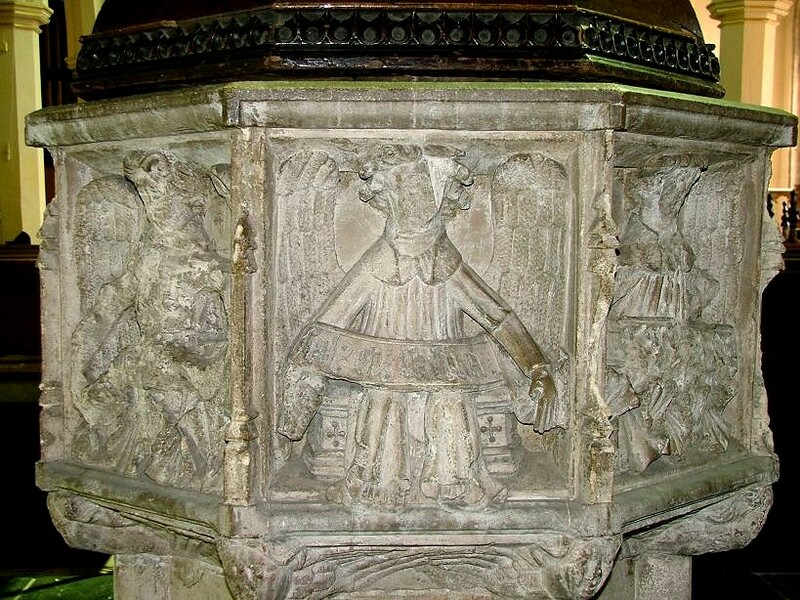 When Edmund Withipoll died in 1574, he was buried in St Margaret, and you'll find his tomb near the organ. It says Mortui Sine Hosti on it - 'he died without an enemy' - although I suspect that this was wishful thinking on the part of the Withipolls. I said that the inside does not live up to the promise of the exterior, but there is still much to see. 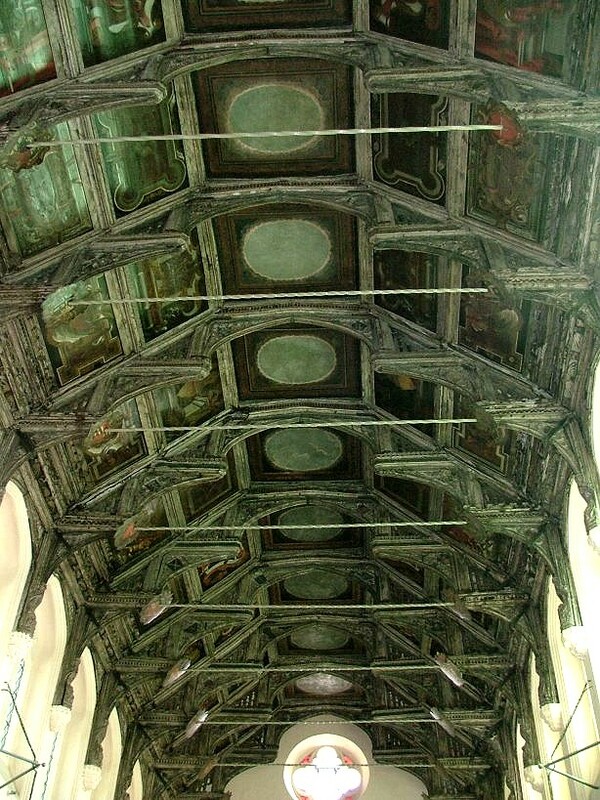 St Margaret has the best nave roof in Ipswich, one of the best in all Suffolk. 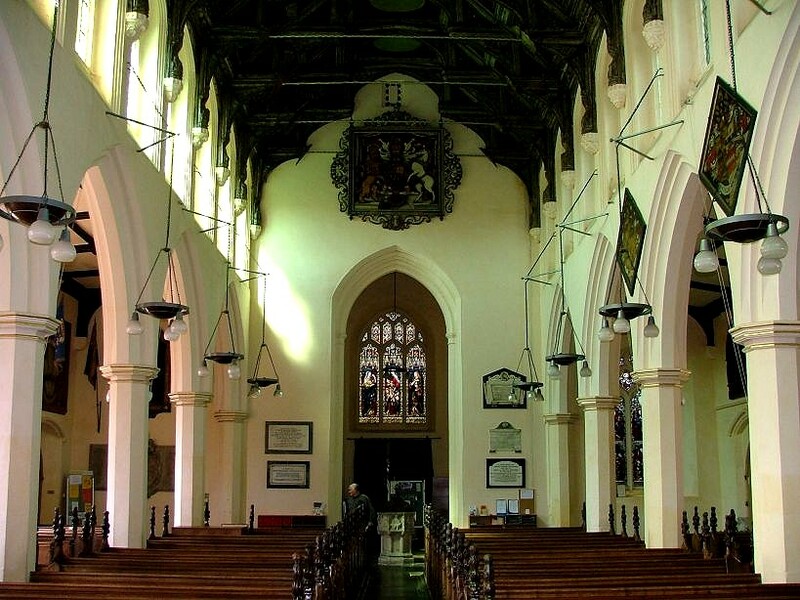 It is a fine double-hammerbeam affair, resplendent with (albeit restored) original colouring. The angels were dispatched by our friend Dowsing, and replaced by the heraldic shields of the seriously rich. Its spreading was noted in the 19th century, so the tie beams were put in - but they are not too intrusive. When it was restored in the mid-1990s, it was possible to go up on the scaffolding, and actually reach out and touch the hammers. To the east, the chancel is curiously low-brow in comparison with the rest of the church, though the east window is pretty. 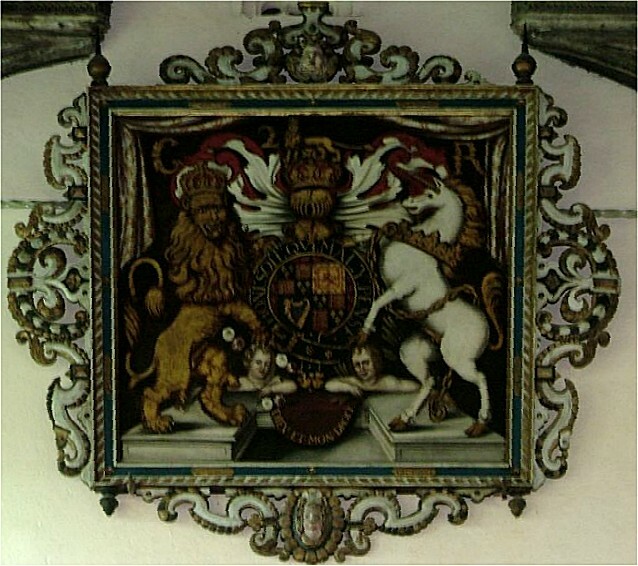 The Royal Arms of Charles II hang at the west end, and above the south door we find the Fleur de Lys of the Prince of Wales, as in a couple of other Ipswich churches. 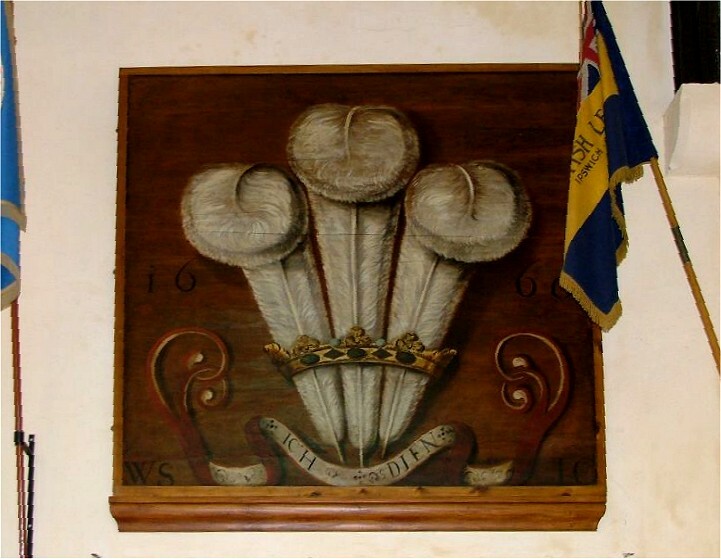 As Mortlock points out, the date of 1660 on them is interesting, because there was no Prince of Wales at that time. So it may have been a bit of Royalist propaganda. In front of the tower arch, there is the fine font. Now, this is heavily circumscribed, either in the 16th century by Anglicans or the 17th century by Puritans. The angels hold scrolls, and the writing on the scrolls has been defaced - except on one. This carries the words sal et saliva ('salt and saliva'). This refers to two of the elements of sacramental Baptism. Why did it survive? 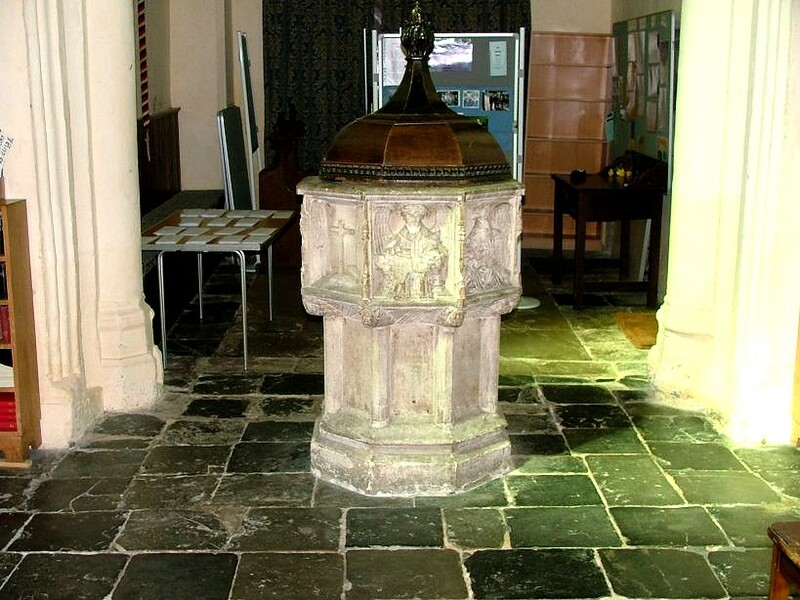 Perhaps the font had been moved against a pillar during the 16th century post-Reformation reordering, and so this panel was hidden from those who destroyed the others. 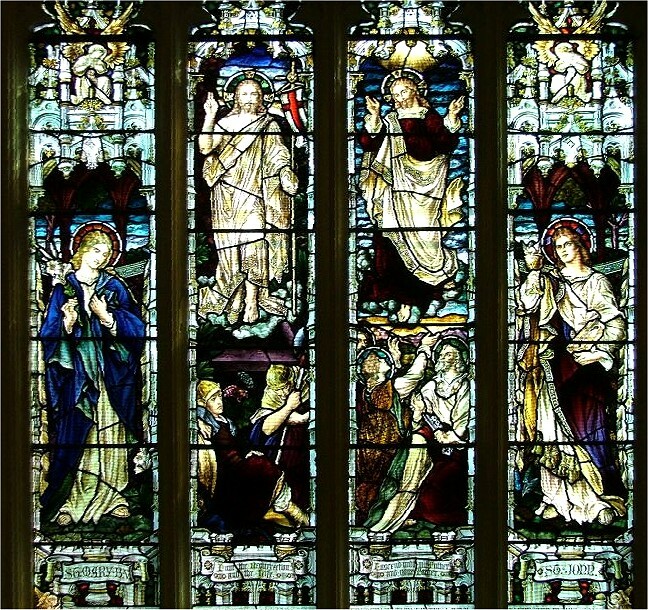 Perhaps the others carried words illustrative of the other six sacraments, with something else for the eighth scroll. The most badly vandalised angel has been recut into a simple cross, presumably in the 19th century, but it is rather odd. 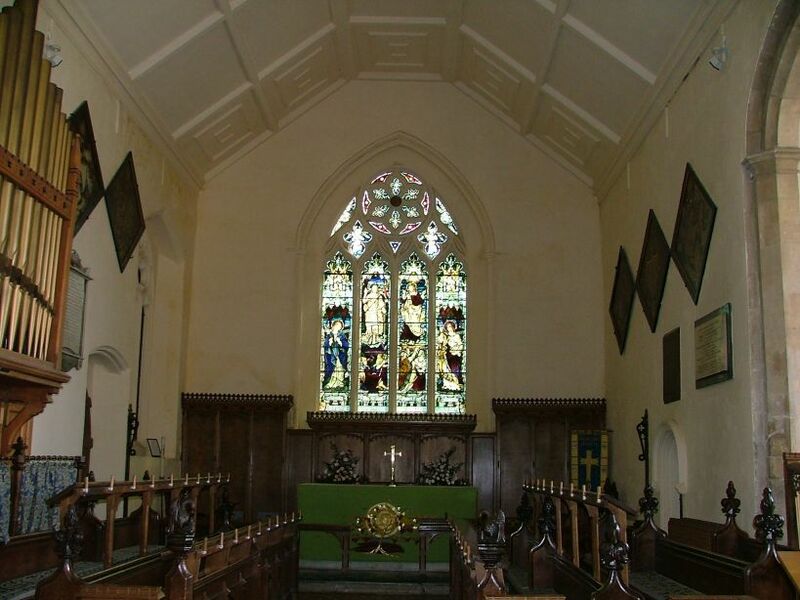 The church is a lively one, with one of the wealthier catchments in the county. All those big houses to the north of Christchurch Park have this as their local church. There was a recent fashion for styling the church 'St Margaret of Scotland'; but this is probably wrong. 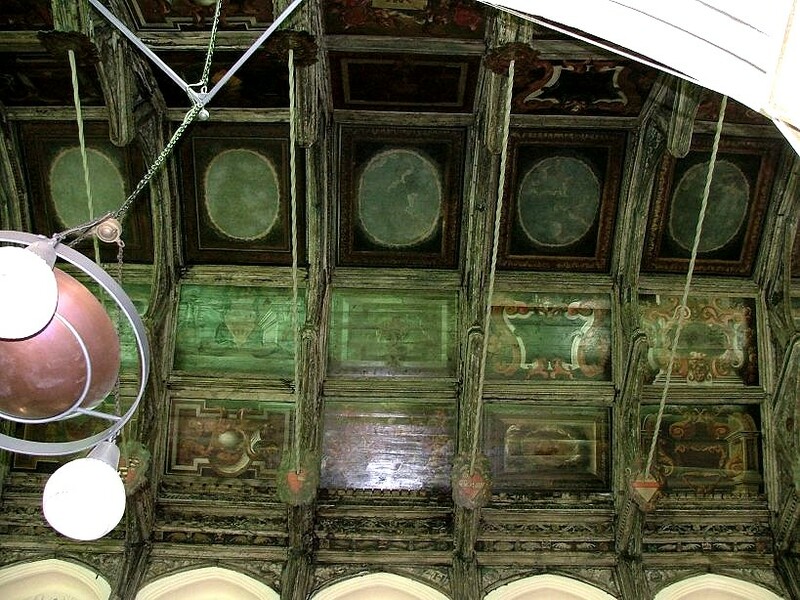 John Blatchly has pointed out that the dragon imagery in the roof spandrels suggests a probable dedication of St Margaret of Antioch. 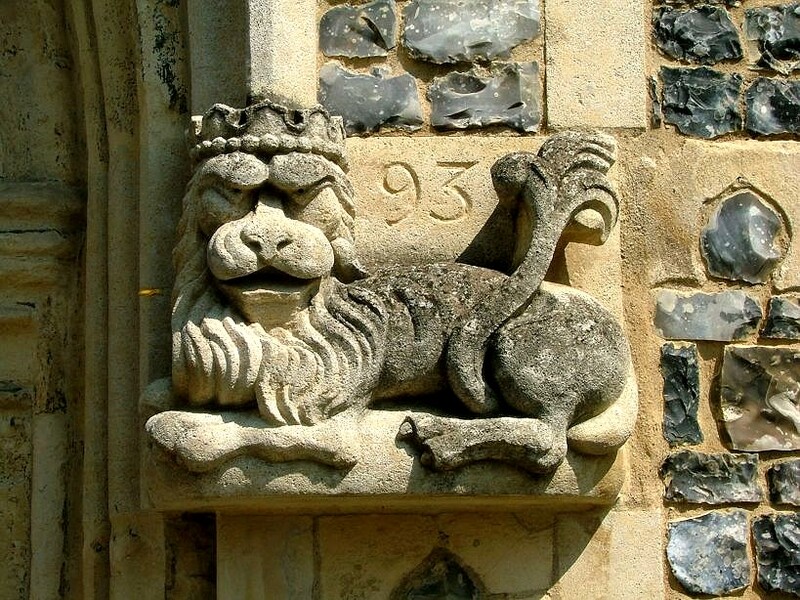 Never mind; most of the church dedications of Suffolk are not wholly correct, so I don't see anything wrong with a parish proactively taking on one that they are fond of. When you finish here, walk out and around into the park. A blocked-up doorway in the churchyard wall was obviously the one used by the Withipolls and the later Fonnereaus on their way to Divine Service. It may even be old enough to be the one used by the Friars themselves.